This article first appeared in The Edge Financial Daily, on November 1, 2017. The focus is on the battle the protagonist fights to get out of her predicament. In 1999, English playwright Sarah Kane wrote 4.48 Psychosis, a non-narrative play which echoes her experience with severe clinical depression. The play is Kane’s most fragmented piece of work, presented as episodes in the protagonist’s stream of consciousness; it was also her last work — shortly after completing the play, Kane committed suicide at the age of 28. The play premiered posthumously in 2000 at the Royal Court Theatre in London, and since then, each production of the play has varied greatly, owing to the vague nature of the script. 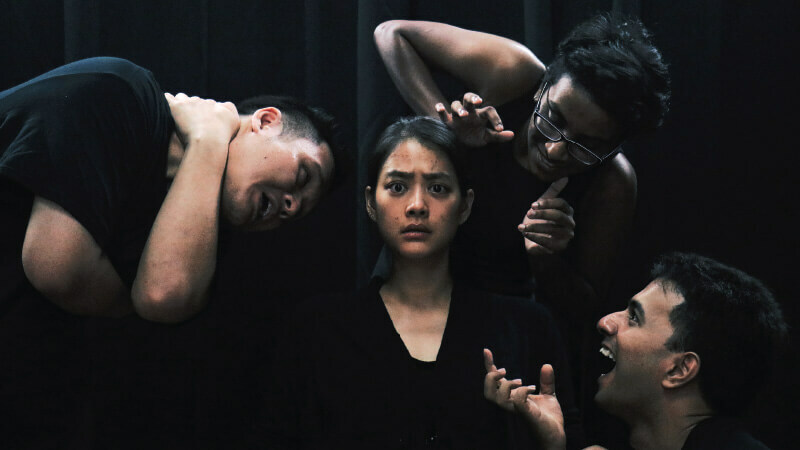 Ahead of Kelvin Wong’s upcoming production of this play, we spoke to the director and founder of local theatrical company Theatresauce to discuss his take on this intense piece of theatre and how he’s made 4.48 Psychosis his own. Live It! : Why did you choose to stage 4.48 Psychosis? Kelvin Wong: I first directed this play two years ago in New York, as my final project in graduate school. Back then, I directed it as an experiment in style, as a culmination of everything I had learnt, and so the subject matter did not stand out as much. This time round, I delved into the subject matter itself, as I realised that the subject of clinical depression has become a major topic on social media. It also became more of a personal thing, as after returning from New York, I got into a bout of depression myself, where I was questioning my purpose and ambitions. When I picked up the play again, I found a lot of similarities between what Kane went through and what I was going through. Having spoken to my friends and classmates, I then realised that depression was not something that I was going through alone, but something that a lot of people battle at some point in their lives, and that nobody wants to admit it or knows how to express it. This is why 4.48 Psychosis has become such an important production, as well as a very personal one, because even though clinical depression is quite prevalent in our society today, we don’t know how to deal with it, or how to help our loved ones when they experience it. Tell us about the challenges you faced in directing 4.48 Psychosis. The original script is non-narrative and non-linear, and so there is no explicit story. The play is made up of episodes that the protagonist goes through while battling depression, put together to create a sort of montage. That makes it challenging to put up, because I had no specific story to refer to, and so there was no sure way of telling if what I was doing was right or wrong. What I did was come in as a director and set my own rules and boundaries to work with, and from there I was able to gauge whether I was closer to the story I wanted to tell as a director. What was the general concept you had in mind when you interpreted the script for the stage? I drew from my own experience with depression, where I felt like our minds travel from one place to another. And so in the play, each episode is a world on its own. If there were a story, it would be the story of a person travelling through different places in her head while trying to find light amidst all the darkness. This is where sound and lighting comes in to bring our audience aboard the rollercoaster ride of our protagonist’s mind, travelling from a game show to a clinic to a dance club. Every world is distinct, but there are symbols and motifs in each world that connect the stream of consciousness throughout the entire play. The Netflix series 13 Reasons Why recently sparked a controversy over its graphically explicit depiction of the main character’s suicide. The show received a lot of criticism for glamorising suicide, as well as for handling the topic of suicide irresponsibly and insensitively. In light of that, how did you handle the similarly sensitive topic of clinical depression in 4.48 Psychosis? What I have seen in previous productions of 4.48 Psychosis is that, even from the very beginning, we see that the protagonist wants to die, which can get a little grating as the rest of the play is just about “I want to die, I want to die”. The direction we have chosen to take, however, is to show that while the protagonist has a lot of darkness in her mind, she does want to get out and she does try very hard to save her life. Therefore the play is not so much about suicide —because it is not about suicide — as it is about someone who is struggling to stay alive, but has reach the end of her road and really does not know what to do. We hope that the audience can then empathise with her and understand her choice to leave this world and go somewhere else, regardless of whether she does take her life or not. I think glamorising suicide comes from using a popular medium, such as television, to clearly carve out and highlight the moment in which suicide takes place. None of that happens in our production of 4.48 Psychosis, as there is no explicit suicide scene, but rather the focus is on the battle the protagonist fights to get out of her predicament. There are people around her within the play who try to help her — there is a psychiatrist, a father, and a friend — but they don’t know how to either, which is quite reflective of our world today, where none of us know how to deal with depression. Which is why we have collaborated with groups like The Mind Psychological Services and Training, as well as Relate Malaysia, to set up booths outside the theatre for anyone who wants more information on mental health. We will also have post-performance conversations with the audience after the shows on Fridays and Saturdays, accompanied by licensed clinical psychologists. Is there a specific impact you intend for the audience to feel from watching the play? We hope that the play will become a starting point for people to talk about depression, and help make it less of a taboo. If you had depression a hundred years ago, people would probably think you were crazy. Nowadays, while depression remains a taboo topic, people are slowly becoming more comfortable talking about it – but it is still not enough. Also, just because people talk about it, doesn’t mean depression simply goes away. Do we know how to cope with it, or how to help and support one another through it? It is not something that is taught in school — we are taught civic consciousness and how to be a good Malaysian, but there is very little on how to take care of ourselves. And so through the play, we pose the question “what is light, and how do we find light when darkness approaches?” — light being our dreams, hopes and ambitions, and darkness being cynicism, doubt and fear. When we find ourselves caught in this rut, what are we going to do? Does the play actually answer these questions? No, and I think that is exactly the point. The play does not explicitly give a solution for dealing with depression. This is not an academic presentation of depression, where you are presented with solutions. What you would experience by watching the play is empathy for someone going through that journey and deciding to end it, for you to then come up with your own conclusions as to what you would do when faced with such a situation — be it whether you experience depression first-hand, or a friend of yours experiences it. Instead of providing you with answers, it is meant to raise even more questions, and the answers will then come from yourself. That is how I feel we can change the world that we live in. 4.48 Psychosis runs from tomorrow until Nov 12 at the Indicine in Kuala Lumpur Performing Arts Centre. The production features Phraveen Arikiah, Claudia Low, Alex Chua and Veshalini Naidu. For ticketing and showtimes, visit www.klpac.org or call (03) 4047 9000.